Coating and grinding technology of tools - Purros Machinery Co.,Ltd. In the regrinding process of the drill bit or milling cutter, cutting lip should be ground to remove the original coating, so the grinding wheel used must be of sufficient hardness. Regrinding pretreatment of cutting lip is crucial, not only to ensure that the geometric shape of the original cutting lip after regrinding can be fully and accurately retained, but also to require regrinding to be “safe” for PVD coated cutting tools. Therefore, unreasonable grinding techniques must be avoided (e.g., rough or dry grinding that results in tool surface damage due to high temperature). All existing coatings can be chemically removed before the tool is recoated. Chemical removal methods are commonly used for complex cutting tools (such as roller burnishing tool, rotary broaching tool), repeatedly coated tools, and tools that have problems due to the thickness of the coating. Chemical removal of coatings is usually limited to high speed steel cutters because it can damage the hard alloy matrix. Chemical removal of coatings will remove cobalt from the hard alloy matrix, resulting in loose surface of the matrix, generation of pores and difficulty in recoating. At present, the typical recoating process is to remove the original coating by regrinding process. The most common tool coatings are TiN, TiC, and TiAlN. Other superhard nitrogen/carbide coatings are also available, but not very common. PVD diamond coated tools can also be reground and recoated. The cutter should be “protected” from critical surface damage during recoating. It is often the case that after the user has purchased an uncoated tool, a coating is applied when the tool needs to be reground, or a different coating is applied on a new tool or reground tool.In many cases, we remove the TiN coating from the cutter and reapply the TiAlN coating. Because users want to improve the production efficiency of tools, TiAlN coating tools are faster and more resistant to high temperature than TiN coating tools. Users often wish to get new coated tools with better performance from tool makers. So ‘tool makers may have to redevelop a new tool with a TiAlN coating’. But compared to redeveloping the new cutter, it takes much less time to remove the TiN coating from the old cutter and apply the TiAlN coating. Just as a cutting tool can be reground multiple times, cutting lip of a cutting tool can be recoated multiple times. “The key to improve the performance of the tool is to obtain a coating with good adhesion on the surface of the tool that has been reground.” With the exception of cutting lip, the rest of the surface of the cutting tool may not need to be removed or recoated during each trim, depending on the type of cutting tool and the cutting parameters used in machining. Roller burnishing tool and rotary broaching tool are the tools that need to be removed from the original coating for recoating, otherwise the performance of the cutter will be reduced. When recoating without removing the old coating, a thickness is added to the outside diameter of the cutter. In the case of drill bit, that means the drill hole is getting larger. Therefore, the influence of the additional thickness of the coating on the outside diameter of the cutter must be considered. 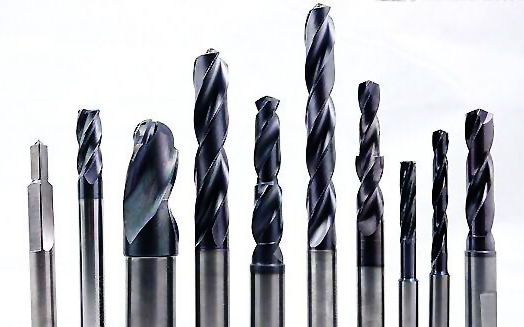 A drill bit can be recoated 5 to 10 times without removing the old coating, but will face serious errors after that. The coating thickness is not a problem within the error range of 1. However, the effect of coating thickness must be considered when the error is within the range of 0.5-0.1 m. As long as the thickness of the coating does not become a problem, the recoated, reground cutter may well be better than the original performance.